Faucets are often an overlooked yet an integral component of a quintessential kitchen or bathroom. But how do you choose the best faucet for your kitchen? With numerous companies competing in the kitchen and bathroom plumbing fixtures industry, choosing the best brand can be tiresome. There are a plethora of faucets available in the market and they come in a diverse array of styles and finishes, with various features and a broad price range. Glacier Bay is one of the best brands that designs and sells a wide range of kitchen faucets. We have reviewed the Glacier Bay brand and three of its best products to simplify the process of finding the best faucet for your kitchen. Glacier Bay offers toilets, bath vanities, faucets, sinks, hardware and accessories, bath mirrors, and many more products. Glacier Bay seeks to provide entry-level kitchen faucets for homemakers and DIY-installers at affordable prices. The brand is owned by Home Depot and its range of kitchen faucets is widely available all over the world. 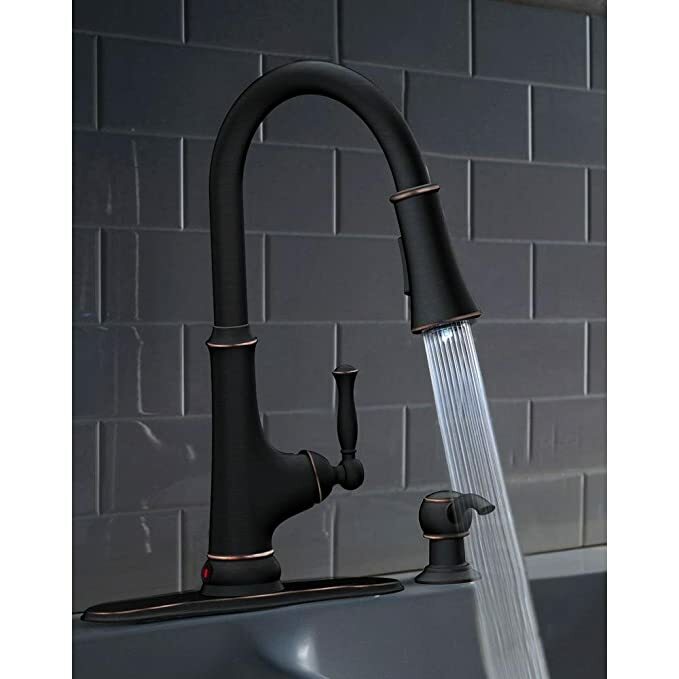 Although you will not find a lot of options from this brand, the faucets are easy to install, look beautiful, and offer great utility. Whether you indulge in DIY tasks to upgrade/renovate your kitchen or provide professional interior design consultancy for your clients, Glacier Bay kitchen faucets are some of the best options for you to consider. All the kitchen faucets from Glacier Bay have two things in common – highly durable and very easy to install and use. We especially like the fact that manufacturer and retailer guarantee back all of the products. Glacier Bay has about 70 kitchen faucets for you to choose from. But you do not have to go through all of them as we have shortlisted the best options for you to choose from. Let’s have a look at the three best Glacier Bay kitchen faucets! 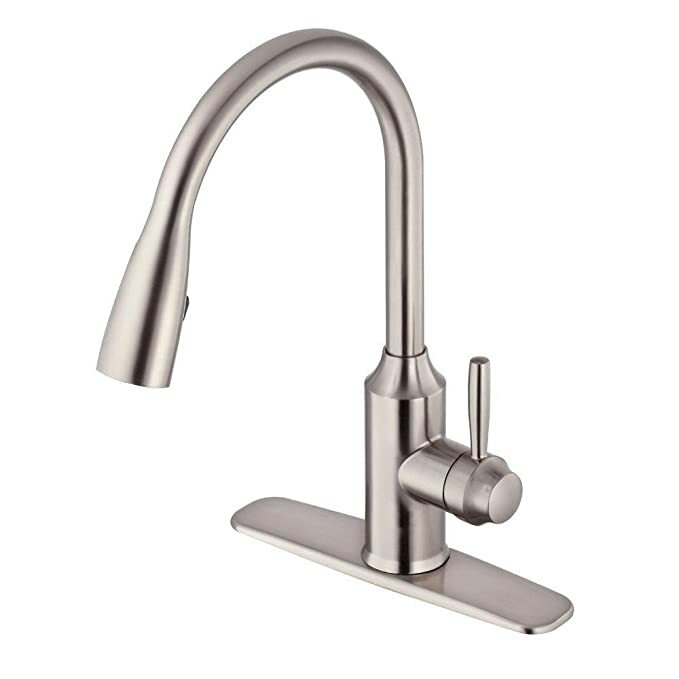 Glacier Bay’s FP4A4080SS is a single handle pull-down kitchen faucet available in an elegant stainless steel finish. The tap has a standard size, measuring 19.2 x 3.1 x 12.9 inches with a spout height of 7.56 inches. You will notice a sturdy build as it is made from high-quality brass. 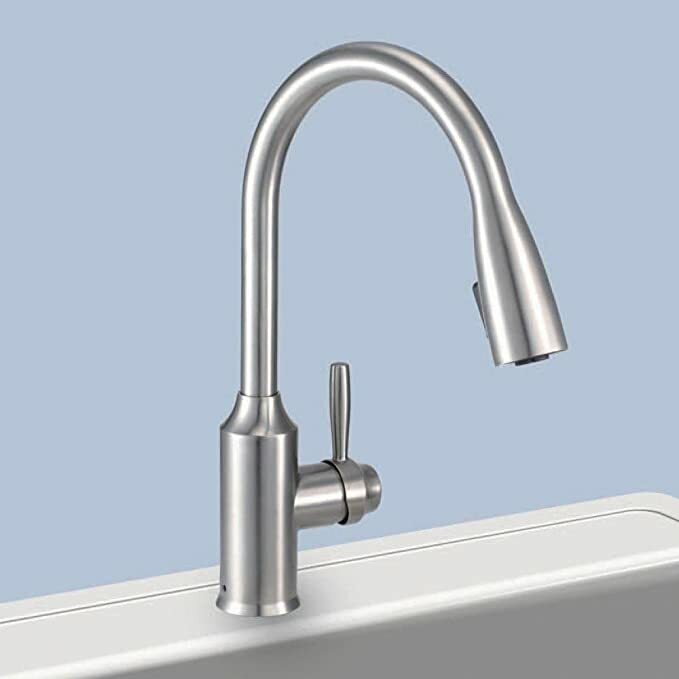 The high arc spout with a flow rate of 2.2 GPM makes this faucet a great option for flow and reach of the water in the sink. The package includes a cover plate, handles, and supply lines. We could not get enough of the lever type handle with a ceramic valve. The faucet is compatible with three-hole sink configurations. Thanks to the intelligent design of the faucet, it can be connected to the sink from above, making the installation quick and easy. You will like the nice and sturdy stainless steel finish that looks classy in nearly all kitchens. We especially like the 360 degrees swivel feature that allows water to flow to all parts of the sink. 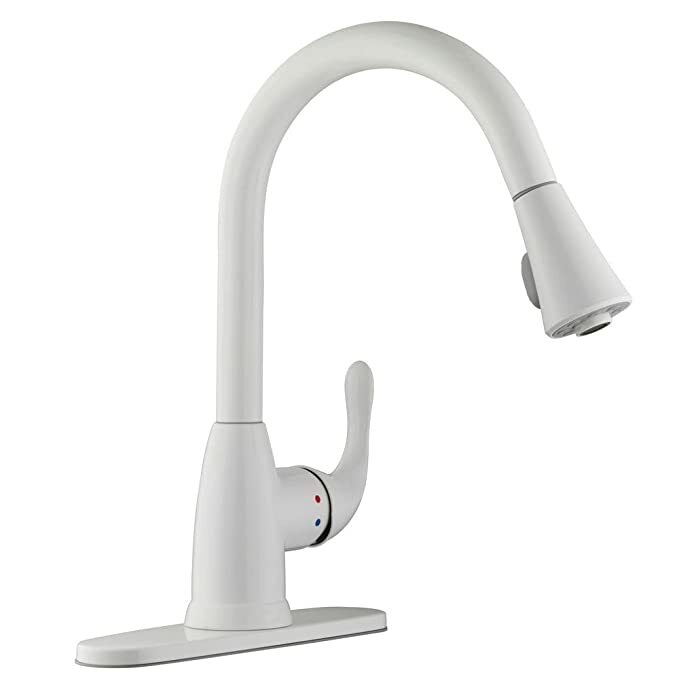 The Glacier Bay Market Pull-Down Sprayer Faucet comes in a classic white finish which is guaranteed to look classy in any kitchen, especially one with a monochromatic color scheme. We like the easy-to-use, single handle design, and the convenient pull-down spray head which features two modes – aerated and full. The faucet includes a drip-free ceramic disk cartridge and has a high-grade metal construction for long lasting durability. You can install it in nearly any kitchen as it is compatible with either one-hole or three-hole sink configurations. It comes with a decorative deck plate that you may or may not want to install. The pull-down spray head has a long reach that makes every part of the sink easily accessible, making it easy to perform various kitchen tasks. The design includes the handle on the right side, making it easy to manage the temperature and flow of water. 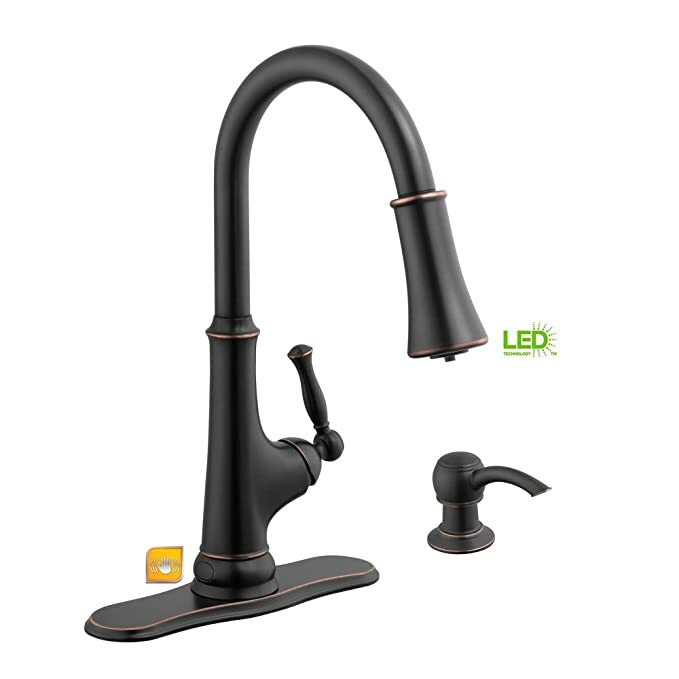 The Glacier Bay pull-down faucet with LED light comes in an excellent bronze finish. You get the benefit of convenient hands-free use thanks to the automatic sensor. The primary benefit of a touchless faucet is that negligible bacteria spread from the kitchen to your hands. All you need to do is wave your hand in front of the sensor to start or stop the flow of water. The pull-down spray head comes equipped with a white LED light that runs off the energy generated from water flow, making it environment-friendly and elegant at the same time. The package includes a matching soap dispenser and four AA batteries for the sensor. The faucet features a ceramic disk cartridge. The spray head features two modes – full and aerated stream. The high arc pull-down spout swivels 360° for maximum functionality. We highly recommend this faucet, given its environment-friendly features like the 1.8 GPM CALGreen certified water flow. Glacier Bay is a home brand of the Home Depot Inc. which tells you that its products are high-quality and well-designed. Buying faucets from a reputed brand that is owned by a multinational corporation which happens to be a leader in the industry hardly ever goes wrong. We strongly recommend that you consider one of the three Glacier Bay kitchen faucets we have reviewed.